Yesterday we discovered that the upcoming Samsung Galaxy Avant is compatible with T-Mobile’s 700MHz airwaves. The device’s FCC filing reveals compatibility with band 12 LTE, as does the filing for an unreleased Sony device, which most expect will be the Xperia Z3. However, there is one device already on sale through T-Mo which is compatible with the A-block spectrum purchased from Verizon earlier in the year. 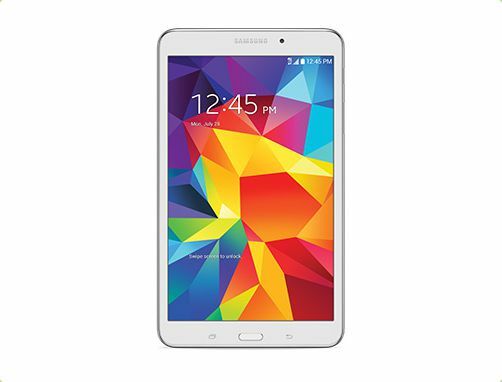 Samsung’s Galaxy Tab 4 8.0 launched recently on T-Mobile and has already been built to work on the network that’s designed to penetrate buildings better than the current, higher frequencies. 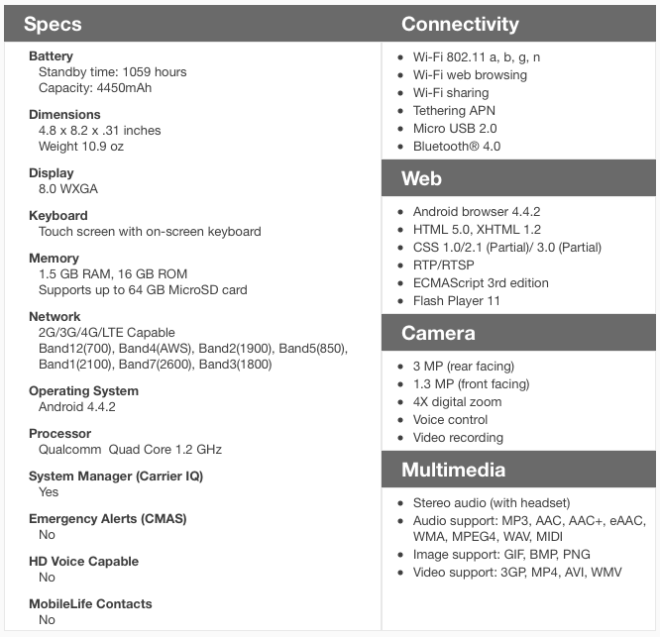 A dig down in to the Galaxy Tab 4 support pages reveals the networks it’s compatible with. What’s more, it also supports carrier aggregation between AWS (band 4) and 700 MHz (band 12) as revealed in the FCC filing. Furthermore, it also supports a connection to AT&T’s 700MHz (band 17) airwaves, potentially allowing the tablet to roam domestically on AT&T’s low-band LTE network. We’re expecting the 700MHz network to go live towards the very end of this year, or beginning of 2015. But, it’s encouraging to see hardware manufacturers getting behind it before the network is even live. The big question for me is whether or not the iPhone 6 will have compatibility built in, or whether we’ll have to wait until 2015’s model before we see an A-block compatible iPhone. Apple, historically, has been slow about adopting newer network technologies. It didn’t even have LTE until the iPhone 5 was released in 2012. What do you guys think? Will we see an influx of band 12 compatible devices being released in the second half of this year? ← Galaxy Avant and Xperia Z3 to be compatible with T-Mobile’s 700MHz LTE? Hopefully the g3 is as well. I know my friend. Just wishful thinking. Yes, get those devices ready Early!! We’ll be prepared for when they switch that low band spectrum on. I hope the next Nexus phone can use this band. i guess it’s safe to say all unannounced t-mo branded phones/tablets here on out are band 12 compatible. Sadly, no. It depends on how early they were developed. Cam, in the article above you say it’s compatible with AT&T’s Band 17 700mhz, but in the specs it actually doesn’t say that it is band 17 compatible. Can you double check that fact? Band 17 is a subset of band 12. The difference is that band 12 contains all channels in the lower 700MHz band, while band 17 subtracts the one closest to the TV channel 51. If that limitation has been overcome, that would be worthy of a seperate news announcement on it’s own. That’s a very clear answer to understand, thank you @Alex Zapata:disqus. Band 17 is a subset of Band 12. So any Band 12 device WILL work on 17. The reason I said should is because we have to take into account any carrier shenanigans, especially here in the states. Wasn’t spectrum exchange between AT&T and T-Mobile a report from a few weeks ago? It didn’t have anything to do with 700 MHz. All of that was mostly AT&T divesting Cricket/Leap’s AWS spectrum as a concession for the FCC allowing the deal. T-Mobile exchanged some extra PCS spectrum with AT&T as well. I’m pretty sure the Nexus 6 will have it. Since the Nexus phones only work on ATT and TMO, I’m sure they are aware of Band 12. At that last Google conference, the phones they were using for demonstrations were running on the TMO network. I can’t imagine they would leave out Band 12 when so many Google people would benefit from it. What about the Note 4 coming in Sept? Obviously he is inquiring what the likeliness is it will have 700 Band 12, that’s “what about it”. We won’t know until the specs are published. Please forgive my naivete…is this something that’s hardware fixed or is it a possibility that a software update would allow this on a particular phone in the future? I’m inclined from the readings to think it’s hardware based, but that’s far from my area of knowledge. While many phones have radios in them that could support the new band, the frequencies the phone can use are hardware-based because phones must be certified for each specific frequency by the FCC before they can be used. Phones also need filters and duplexers (new hardware) installed for proper compatibility with each frequency. In short, while a software update could technically activate new frequencies, there needs to be FCC certification and certain pieces of hardware in place before they new frequencies can be activated. heh, beat me to it. Every phone has a special filter that blocks the radio signals that are not wanted. This helps to prevent unwanted interference and increase signal and speeds. I’ve been trying to figure out that as well. The tech is kind of available in that there are software defined radios that combine the transceivers and antenna tuning and basic filtering into one chip that can handle all announced Bands for the release category. The Galaxy S5, HTC One M8 are known to have one capable of all Cat 10 Bands, but I’m not sure about the LG G3. However there are still cases where additional filtering still needs to be built onto the board to prevent interference on other bands to meet the demands of each countries requirements. That’s as near to what’s going on as I can figure out without being an electronics engineer in the industry. If it really is as simple as just patching the modem software then it’s possible to re-submit to the FCC for certification, and then push the patch with a later software update. However if that’s the case then it makes me wonder why the hell they didn’t make an announcement at launch like they did when the Note 2 came out LTE capable prior to T-Mobile’s LTE launch. That’s a pretty big upsell opportunity they missed out on. Cat 10 Band is 1700MHz and yes the GN3 is compatible with that…. I guess I mixed up the terminology a bit but I was referring to the LTE release that the transceiver chipset was designed for, not the individual bands. The chip used by the Galaxy S5 is a Qualcom WTR1625L, searching online a bit shows it is a release 10 chip and supports all bands that were ratified for LTE release 10 which includes band 12. I also had the LG G3 in mind, but I guess I should have gone back and edited that in sooner. Or did you think I was replying to your question about the Galaxy Note 3 supporting band 12? I’m pretty sure the Note 3 came out way before T-mobile was even considering the Band 12 deal with Verizon so I doubt it would support it or receive an update to add support. Guys is the Galaxy Note 3 700MHz compatible? No, it does not support band 12. Serge check out my post I just uploaded…Maybe the GN3 is compatible…..Hmmmmm…..
By the time that T-Mobile has 700Mhz anywhere the Galaxy Tab 19.1 will be out. Since all Verizon phones are all unlocked by default would it be safe to say that all Verizon phones will work on the magenta network? I know my iPhone 5 s is like that. The galaxy s5 does work but no volte. That is the only limitation I can see for now. The iPhone even gets all the t-mobile carrier updates. That would not be a safe assumption to make… The devices from Verizon must have the proper frequency bands in order to work on T-Mobile’s network, that being said, the iPhone 5S supports all frequencies used by T-Mobile and that is why it works, I don’t know about the galaxy… The frequencies are 1900, and AWS band 4 for 4G LTE… The Verizon iPhone 5S also works on AT&T and even Sprint, however Sprint won’t activate it! Aren’t all of Sprint’s LTE bands on there too (specifically Band 7/2600 and Band 5/850)? Sprint LTE bands are 25/26/41. No. Sprint’s PCS LTE network operates on PCS A-G, Band 25. So there are two different bands for LTE on 1900 MHz? Band 2 and band 25? Why? Sprint is silly to not have interoperability with other carriers, in fact Sprint should allow users to bring their own devices even if they are CDMA! The radio frequency band spanning 698 – 746 MHz. Smaller regional carriers – such as U.S. Cellular – use blocks A, B, and C. That range is also known as band 12.